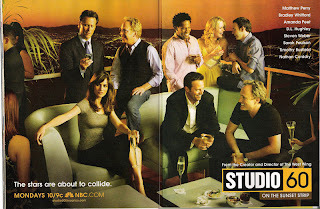 Studio 60 on the Sunset Strip is an American TV series first shown on NBC in September 2006 which is now airing on TV3. The show was created by Aaron Sorkin (also known as the guy that created the West Wing) and it takes place behind the scenes of a fictional live sketch comedy show. The two main characters are Matt Albie, played by Matthew Perry and Danny Tripp, played by Bradley Whitford. Matt Albie is the head writer of the live sketch comedy show and Danny Tripp is the producer/director. Bradley Whitford played Josh Lyman in the West Wing and Matthew Perry played a smaller role of Associate White House Counsel Joe Quincy later in the same series. I really like this programme because it’s funny and interesting. I like the characters a lot and it’s nice to see that both Bradley Whitford and Matthew Perry have found credible roles after the demise of the ‘West Wing’ and ‘Friends’. Unfortunately many US television critics and analysts believe that the show will not see a second season. The possibility that his show will be canned so quickly really annoys me. Television is badly in need of some good entertainment and escapism not more reality TV programmes with people blatantly angling for 15 minutes of fame. I hope this show makes it to a second season and that reality TV dies off rapidly in the near future. I love Studio 60 too. I hope they do bring it back - apparently there's another three episodes they've filmed that will be shown on US tv in the summer. Fingers crossed! # posted by hellojed : May 01, 2007 10:00 a.m.
Three more episodes - that's great news, it would be a shame if they stopped making it. # posted by Betty the Sheep : May 01, 2007 10:37 a.m.